Decastro then went on to vent his frustrations over the way bureaucracy had thwarted his previous Championship efforts. “Unfortunately bureaucratic red tape caused the fights to be cancelled, either Visa issues came into play, as with the original planned fight against Agoe (Ashong) in July or worse still unnecessary political interference by the EBU, which scuppered the IBF European fight against Ronnie (Landaeta). 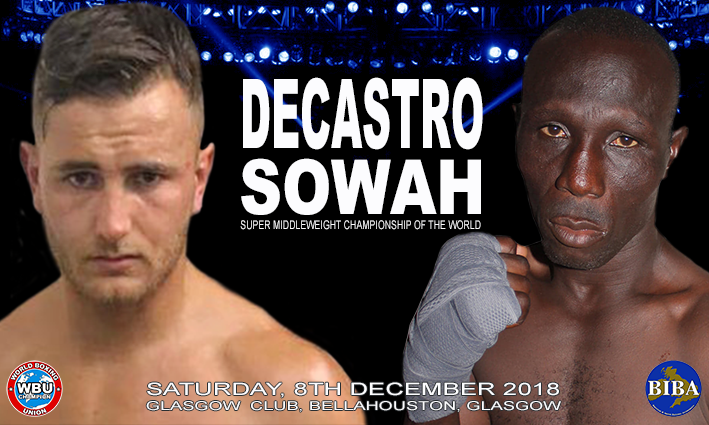 Nathan ‘Nightmare’ Decastro versus Daniel Adjei Sowah for the World Boxing Union (WBU) Super Middleweight Championship of the World, is the main support for the highly anticipated return to the ring of two time WBO World Champion Scott Harrison (27-3-2) against Tackie Annan (11-6-0) at the Glasgow Club in Bellahouston, Glasgow on Saturday the 8th December 2018. Tickets: Priced £60 (Ringside), £50 (Outer Ringside) and £40 (Standard Seating) are available from the Assassin Boxing Promotions Ticket Line: 07594 144433 and on-line at www.tkoboxoffice.com.